Did you think to save? Plan what you will need. Oh, how ragged are your clothes. When the "good life" goes. May not sound so hot. They can hit the spot. Cloth and patterns, thread and needles. Store some long Johns, too. Once cooked, stir in beans and 1 cup of the salsa. Preheat oven to 350 degrees while the quinoa is cooking and coat a baking sheet with nonstick cooking spray. Lightly coat tortillas with nonstick cooking spray and top with remaining salsa and cheese, dividing equally. Bake burritos at 350 degrees for 12 minutes until heated through and cheese is melted. The result? They were fantastic! Ric thought that adding some shredded chicken would be even better - maybe next time! The best part is that it's a flavorful meal right from your food storage! (Yes, I'll be storing quinoa from now on!) Here's some more info about this grain, it's really good and good for you too! I was poking around Facebook the other day - did you know that they have an application you can add to promote your blogs? Anyway, I found this great preparedness website called Daily Survival. It's a collection of preparedness and survival articles that are found on the web. There are TONS f great ideas that link back to the original blogs if you are interested. I was practically PAID to shop! Part of being prepared is building up your food storage for those times when you might need it. Because of this, I'm a completely obsessed coupon and sale shopper. For a while, I played The Grocery Game - which is a great website that tells you what is on sale and when to use your coupons. After some time, I figured out the pattern so I stopped paying for their lists and tried to keep track of things myself. It's a little hard, unless you have a system. Today, I was practically PAID to shop at Shaws. Just a few more dollars and I would have been! First, a little background on how I shop. I do not buy the essentials (Milk, Bread, Eggs, Butter, Cheese, etc.) from the "regular" stores. I have found that the prices are hyper-inflated. Instead, I pick up all of those things from Aldi. (What? Never heard of Aldi? I'll have to tell you the story about that sometime and how a friend turned me on to the BEST place for basics - and much more - ever!) For other things, I scour the ads and check my coupons to get the best deals. Skippy Peanut Butter - 16 oz regular price $2.50, on sale for $1.67. I had 4 coupons that gave me $1 off for every 3 I purchased - AND if I spent so much, I also got a coupon for $10 to use at another time. Result: $6 spent - $24 saved. 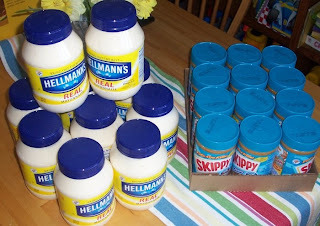 Hellmans Mayo - 30 oz regular price $4.29, on sale for $3.00. I had 5 coupons that gave me $1 off for every 2 I purchased - AND again, if I spent so much, I also got a coupon for $15 back to use at another time. IN STORE BONUS - I wasn't aware of this before I shopped, but I also got ANOTHER $10 in coupons from Hellmans to use on any products the next time. Result: $25 spent - $25 saved! I have to say, that I was pretty much skipping to my car with my Mayo and PB. Woo Hoo! The message I want you get from this is to just spend a little time organizing yourself and paying attention to the ads and sales, and you will SAVE A TON on your shopping! I'd love to hear what you do to save money while you are adding to your food storage! Just leave a comment! PS - Just so you know, I don't purchase 5 different Sunday papers to get all my coupons, I have GREAT neighbors who save what they don't use for me every week! PPS - It's so much fun to hear the comments from the gals at the checkout when I'm shopping. Today it was...WOW, looks like you'll be making a ton of potato salad soon! And the other gal said something about liking peanut butter, but not THAT much! hehe They were impressed though, with the final amount I owed in the end! You'll want to check out my sister's blog (Let Us Prepare.) Last November, Wendy DeWitt presented a Food Storage Seminar that was recorded, and now is available! There are 9 different segments (because of YouTube requirements), but they are all loaded on this post. You can also search YouTube for Wendy DeWitt. A poem...very appropriate for today. Those Silly Silly People, why were they all so blind? We certainly, would never be, a people of that kind! Cause God had, had it up to here and the wicked he would trod. Cause God has had it up to here and the wicked he will trod. and if our scriptures on the shelf, show not wear or tear. Could we be silly people? Are we possibly that kind? That we refuse to hear our God, could we be "Oh So Blind?" The number 3 is a magic number when it comes to emergency preparedness. You can survive for about 3 hours without shelter, about 3 days without water, and about 3 weeks without food. So, to keep with the magic number, we should try to find 3 ways to deal with each of those situations. For shelter, there may be circumstances where we can shelter in place and use our home as a shelter. Other times we may be stuck in our cars. Keeping some basic items in our car in case we need to use it as a shelter can be life-saving. Some water pouches, survival food bars, hand warmers, emergency blankets, a Ready candle, and waterproof matches can help us keep warm in a winter storm situation. And what if a major earthquake made sleeping in your home impossible? Consider a backpacker dome tent or even a tube tent plus emergency sleeping bags. Next is water. You can store a lot of water in your home by using the 30 gallon barrels and then adding the water preserver so you only have to change the water every 5 years instead of every year. You can also think about portable water in case evacuation becomes necessary. The 5 gallon stackable water containers are great for this purpose. And what if you had access to water, but it was contaminated? Think about potable aqua and an MSR miniworks water filter. The miniworks can filter up to 500 gallons of water, so it is a great tool to invest in. Last is food. Survival food bars are compact enough to store in your car or even in your desk at work. You can store MREs and freeze-dried pouches in your 72-hour kits. And the #10 cans of freeze-dried food are terrific to store in your home for longer term food storage. Emergencies and disasters don’t always happen how we plan, so by taking steps to resolve these 3 essential issues in at least 3 ways, you can feel secure in your emergency preparations.